Snow, ice, wind and temperatures in the teens and 20s. Those words could describe any day from December 1 through March 31 in East Ohio. Shoveling and scraping can be inconveniences but the elements are so much more than that to countless people who can’t afford clothes to keep them warm. The congregation of Firestone Park United Methodist Church (Canal District) in Akron decided to lend a hand to those in need. “It’s important for us to be aware of these opportunities and not walk by and ignore them,” said the Rev. Pat Christ. Assistant Choir Director Shelly McConnell saw a Jan. 23 article in The Huffington Post that highlighted random acts of kindness in cold weather cities across the country. She posted the article to her Facebook page and brought it to the attention of her pastor. “We thought this is just one of many simple, easy ways to make a difference in the world,” said the Rev. Patricia Christ. A request was placed in the newsletter and in the Feb. 1 bulletin asking for donations of hats, scarves and gloves to be brought to the church. In one week 60 items were collected! 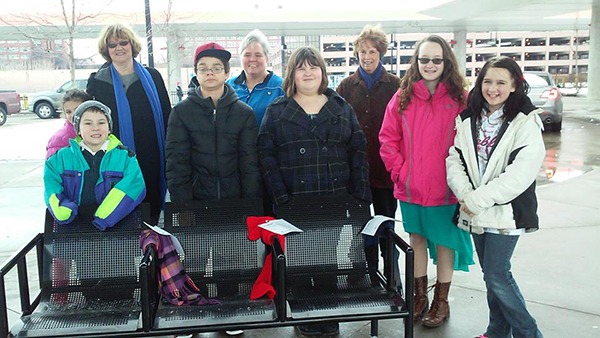 Christ recruited students from the confirmation class, other teens and adults to take the items to the Akron Metro Bus station. Once there, members of the Firestone Park UMC group tied the scarves to benches and placed the hats and gloves in clear bags that they attached to the fence. A sign was placed with each item: “I’m not lost! If you are cold, please take me with you.” The sign included the schedule of free lunches and dinners provided at the church. “We were hoping somebody would see the scarves, take them and know that somebody was thinking of them,” Christ said. 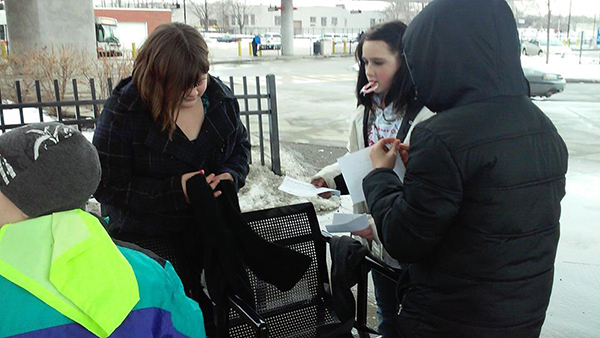 “The youth were excited about helping the less fortunate, especially when they saw someone taking one of the scarves,” said Susan Shaw, who is the church mission coordinator and one of the volunteers who went to the bus station. Christ and Shaw both said the day was a learning experience for all involved. The volunteers were able to experience the gratification of helping others while those who use the bus were witnesses to the impact of generosity. *Rick Wolcott is director of Communications of the East Ohio Conference of The United Methodist Church.